As we started to do and didn’t carry through with last year due to time constraints, we leave a table of contents at the front of this post with links to all the Files’ movie reviews over 2016 and great/good/OK evaluations for movies the Author will probably never write about in depth. In contrast to 2015’s film-in-review compendium, this one will not include a Bad section seeing as the Author encountered significantly more bad flicks this year and would prefer just to recommend good ones, loosely descending in order of how much he liked them. For inquiring minds, though, the worst movies of the year he saw in whole or part were Finding Dory, Krisha, Purge 3, Ghostbusters, Legend of Tarzan, Suicide Squad, and Miss Sloane. For the purposes of this review I will be comparing La La Land with Damien Chazelle’s previous picture Whiplash, because the comparison is screaming to be made, and with Dancer in the Dark, which happens to be a musical as well as one of my three favorite films. Starring not one but two attractive celebrities and building such steam at my local theater that people were leaving piles of popcorn in the front row two weeks after opening, La La Land has already made 10 to 33 times as much money in America as either of those films, enough that it appears poised to have the best return on investment of the year in cinema. It has colors both vibrant and meticulous: there’s a scene at a pool featuring dozens of people decked out in 1960s-style bathing suits, but Chazelle takes special care that no two bikinis of the same color can be seen next to each other. It has convincing or even invisible special effects, such that no movie this year left me more inspired to read and learn how certain shots were achieved. The sunset dance that lends the poster image looks so striking for such a sustained amount of time that I must believe there was some digital trickery involved, and if there was, the tricksters should have gotten at least a nod from Oscar. 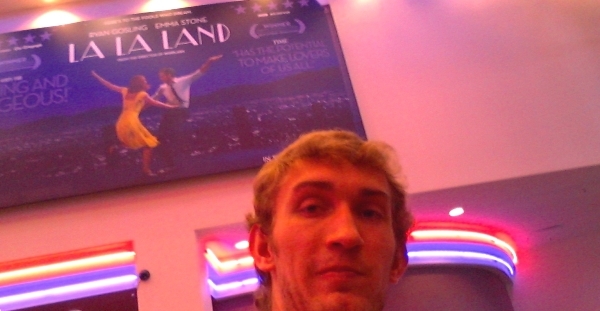 La La Land possesses these and all other perfunctory elements for a runaway blockbuster: sarcastic dialogue, charmingly egotistical Caucasian leads who don’t exhibit a lot of outstanding flaws, references to broadly recognizable cultural iconography, extremely elaborate and jaw-dropping shots, an unlikely love story, and strong overtones of fighting the man/system and following one’s dreams. It’s basically this year’s Avatar or Birdman, two films optimized for seducing the general public and pompous film aesthetes respectively which haven’t aged well in 2017. Unsurprisingly, La La Land takes so many pointers from Birdman that it hits the Oscar devotee like a tractor beam Damien Chazelle cynically devised to nab the award he formerly deserved for Whiplash, a cheaper, more traditional, and altogether more authentic movie. Rather cool rehearsal footage from a mock set giving those who haven't seen it a close approximation of the opening. As an example of this scheme, the film opens with a really audacious, spectacular tracking shot tracking no one person in particular that weaves its way through a traffic jam on a highway ramp before slowly craning down and segueing into the introduction of the main characters, also done in one shot. I think I whispered to my friend in the theater, “That must have been made with a lot of CGI,” which would have been another parallel to Avatar. Silently, though, my intuition told me that something very wrong was happening in the movie, on one hand because I’d felt absolutely no emotions while watching the scene and on the other because the main characters weren’t even in the opening musical number. My concerns were only aggravated by the next song some ten minutes later, which relates Emma Stone’s desire to be noticed and which Chazelle also opts to shoot in one or two extended, color-laden takes. Lyrically, Someone in the Crowd could be classified as a kind of “status-quo malaise” song, similar to Skid Row from Little Shop of Horrors, Deliver Us from Prince of Egypt, Where You Are from Moana, or Everything In Its Right Place in Vanilla Sky. In all these other instances, the status-quo song is the first (or close second) to play in the soundtrack, establishing either the setting of the film or where the character concerned is at in life. It’s also usually visualized in a style fitting the tone of the words and performance. In Little Shop of Horrors, which was for a while the pinnacle of movie musicals to me, Frank Oz uses claustrophobic angles and a dingy palette to convey the anxiety of Seymour and anyone else unfortunate enough to live in the trash heap that is Skid Row. Later on, Oz films the triumphant duet Suddenly Seymour a completely different way since it’s expressing a completely different set of emotions. In Prince of Egypt, Dreamworks drew dramatically framed scenes of slave labor and cut on or into jolting acts of violence and toil – the crack of a whip, the impact of a hoe in dirt – to accentuate the desperation of the Israelites. Other techniques and effects are used to evoke fear and wonderment respectively as Moses confronts Pharaoh’s magicians and leads his people out of Egypt. In La La Land, basically no visual distinction is made between a low and a high point in the story. On a narrative level, Someone in the Crowd is relating an unfulfilled longing to “finally be lifted off the ground”, to escape one’s lousy barista job and make it big in Hollywood, but it’s shot pretty much the same way as any other number or non-musical scene in the movie, viz. in an over-the-top, sensual, grandstanding fashion. The one factor Chazelle uses to differentiate scenes in La La Land is the quantity of moving objects in the mise en scene, which gradually levels off until the trailer song, City of Stars, takes an up-turn with the introduction of another jazz musician, screeches to a bare minimum in the audition scene (also done in one shot), then briefly spikes again through the final dream sequence. What’s worse is that whenever the director tries to enhance an emotional moment by scaling it back, as in Stone’s ode to the fools who dream, his method comes across as obvious, pretentious, and contrived. Unlike Birdman or La La Land, Whiplash doesn’t linger in my memory for the bravura and technical impressiveness of particular shots so much as for the way that all the shots beautifully complemented each other and serviced the story being told. When Chazelle did hold the camera for a long time, it was to emphasize whatever emotion was specifically endemic in that moment – Neiman’s determination and prowess in the opening shot, the tenderness and awkwardness of the theater scene, or the intensity of the car wreck. Most of the time, though, the movie cut energetically between medium, close-up, and wide shots, making it an enthralling ride even for those who couldn’t care less about jazz. It was a film that understood that the unique capabilities of film form and implemented them to its fullest advantage. Likewise, the reason Lars Von Trier’s ugly, handheld, cinéma vérité style worked so well in Dancer in the Dark is because it underscored the bleak resignation and ordinariness of Selma’s swiftly deteriorating life. The musical segments, on the other hand, lent a strong counterpoint to the “real-life” scenes by employing brighter colors, locked-down video cameras, dancing, and numerous actors behaving blissfully unaware of their grave circumstances. They also tended to correspond with the darker events of the plot, conveying Selma’s reliance on music and day-dreaming to escape her urgent and frightful reality. Lars didn’t use the medium of the musical because he thought it would be fun or lead to better reception (even to this day Dancer has rather underwhelming scores on aggregator sites), but because Dancer’s story behooved it to be a musical. Both films had a synergy of form and content that raised them above their various parts. La La Land, by comparison, uses music indulgently and haphazardly, and the filmmaking across the board is so pristine and rigid that it really boils down to personal preference which of the choreographed scenes is the best, most of them being superfluous to the plot and not situated in places where one would expect the characters to break out into song. The highway number, as previously noted, is showing off just for the sake of it, and City of Stars, while catchy and pretty, doesn’t signify much of anything aside from the creators’ love affair with Los Angeles. Committing to the one-take illusion for nearly every tune necessitates a blatant break from live dialogue to a pre-recorded audio track, which just hones the fact that neither of the stars are trained singers or doing everything live. In many cases, the extravagance of the colors and motion steers one’s focus away from the human element on screen, overpowering the mind with awe and curiosity at how such feats were accomplished. How much more believable and touching was the ukulele tap dance in Blue Valentine, which probably took a day at most to practice and pull off and didn’t involve any grandiose cinematography? Still a better Ryan Gosling love story than La La Land. It doesn’t help that the music in La La Land, posing itself as an old-school, glamorous Hollywood musical, isn’t very good. To size up La La Land’s vocals against those of Dancer in the Dark obviously seems unfair, but the songwriting here pales even against closer, more mainstream competitors like Moana. Since there exists no substantial link between the upbeat, peppy compositions and the themes of the film, there’s also no compelling reason to revisit them, and those songs that do relate to the characters’ circumstances are so immediate (A Lovely Night) or on-the-nose (Audition) as to make listening to them without the visual accompaniment a waste. Then there’s the matter of Twitter warrior John Legend being in the film, and how his appearance causes La La Land to take a nosedive from which it never wholly recovers. I don’t presume it’s necessary to explain why. I’ve heard some people try to justify the inclusion of “Legend” in the movie as intentionally bad or superficial, so as to show how Gosling’s dreams of propelling jazz to mainstream acceptance aren’t really all that desirable. This is like trying to justify Ruby Rhod’s prevalence in the second act of The Fifth Element because he was supposed to be annoying and loud and moronic. So how do the Oscars fit into all of this, and how did an auteur at the height of his storytelling powers take such an ill-advised, stylistic departure from Whiplash? For the past three years, the Oscar voting committee has lavishly awarded films primarily praised for their long, unbroken takes, those being Gravity, The Revenant, and the ultimate practitioner of the form, Birdman. Coincidentally, all three movies have undergone re-evaluation to some extent since their hay-days, when they were widely hyped up to be visionary masterpieces. The Oscars have made it abundantly clear that all a director has to do to garner praise and accolades is to cram a shot with moving parts and actors and hold it for as many frames as possible, regardless of how many frames are supporting the narrative. If cutting is the exclusive attribute and bedrock of film, then the Academy Awards have been systematically discouraging good filmmaking for years, sending a resounding message that they’ll always value gimmickry and ostentatiousness over form that follows function. Hence we get La La Land, a demonstrably inferior picture to both Whiplash and Dancer in the Dark that nonetheless checks all the boxes for an ego-stroking, cinephile-pleasing Oscar frontrunner, a picture that followed Inarritu and Cuaron’s trail of bread crumbs to take home Best Director without a hitch. There’s so much more to scrutinize that keeps the movie from excelling: how unlikeable Ryan Gosling is, who snaps at his mother, “Then what we would have to talk about?” when she suggests he date someone who isn’t into jazz; how bland the characters are in general; how anachronistic the product placement and references (Toyota Prius, Jimmy Fallon lip-sync battle, cell phones) feel when everything else is mimicking another decade; how unfunny the comedy is; how much Damien Chazelle wants you to like jazz. As it turns out, La La Land was not declared Best Picture of the year, and that’s probably for its own benefit. The ending is satisfying, if undercut by all leading up to it, the cast is hot, and the movie is certainly enjoyable, but had it actually won, the future would probably view it the same way as the present views The Artist, as a mistake. Or maybe I’m completely wrong and La La Land is an intelligent social satire on insulation from reality and middle-class woes in the entertainment industry bubble, ironically featuring Emma Stone and John Legend. Now that would be an Oscar-worthy movie. On February 20, the Amazon-owned IMDb closed its message boards for the first time in more than 16 years, an area of the web that had become my go-to place for learning more about any film that piqued my interest. It was on these same boards that I found lengthy dissections of set decoration in Doubt, coming-of-age symbolism in Hausu, and just who Sammy Jenkins was in Memento. As far as I know, IMDb was the most convenient, if not the only place on the internet one could locate and peruse such interpretations. If it was an issue of money, then I would possibly understand and respect this decision, but it shouldn’t cost a lot of money to keep a text-based message board online, nor does Amazon increase ad revenue by rescinding the forum as there were probably many people who used IMDb solely for the message boards and zero people who avoided IMDb because of the message boards. No. According to IMDb, shutting down the boards was motivated by the fact that they were “no longer providing a positive, useful experience for the vast majority of [their] more than 250 million monthly users”. This is insulting, dolt-headed, and defiant of all common notions of how a company should treat its loyal users. As a result, I am henceforth relocating the Files’ movie ratings to Letterboxd, which more or less serves the same purpose now, allows one to follow the viewing activities of other people, and does it all in a more aesthetic layout. I’d urge anyone else who feels slighted by Jeff Bezos to do the same.